I think this is so cute! I’m trying to find ways to make nice and easy gifts without breaking the bank and showing appreciation in a thoughtful way. I’m sure you will like this one as much as I do. You can buy the rubber (or metal whisks) at a dollar store, a place like Five Below or your local Target, Walmart, etc. Fill them up with some chocolate kisses. I will recommend to use the holiday color ones if you are using a metal whisk so it pops out. 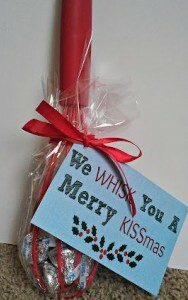 Wrap it with Cello paper and a nice colored bow and card. I love the “whisking you a merry kiss-mas”. Hope you like it!